This week we have a colour challenge over at CD Sunday of Blue, Yellow and Brown, so this was a good excuse to use my new Marianne Designs dies, yes the bottom bird is choc brown, my CD element is the backing paper from MCS Papercraft Library. 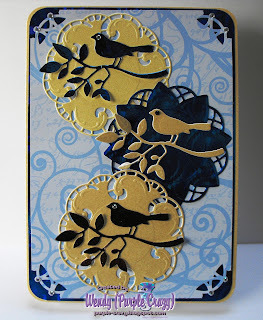 Wow Wendy this is such a beautiful card I love the die cuts. Congratulations just noticed that you have now reached 50 followers !!!!! Nice work Wendy - good use of the die cuts. What a nice card. The decoration is gorgeous.